Co-ordinates introduces basic to more complex skills of map reading and ordered pairs or co-ordinates. The App contains five modules, which focus on a different element of map reading skills and includes, compass directions, alpha-numeric (like a road map B6, F7), numerical (3,4) and negative xy co-ordinates (3, -7). The App includes game like situations, asking users to manipulate, create and interpret maps as well as become more familiar with plotting on xy co-ordinates, including negative xy co-ordinate charts in four quadrants. This App has a wide age range from the first year of school to Year Nine. (Ages 5-14) It is a great pre-cursor to linear equations! As with all Little Monkey Apps, this App is designed to be used in conjunction with hands on activities and teacher interaction. Whilst some of the sections or 'modules' can be completed without teacher direction and encourage student-directed learning, our Apps are NEVER designed to be used as a 'learn by yourself' without teacher-student interaction. This is a blank chart in either negative xy chart or a 0-12 grid. It is best used with a teacher/tutor or for peer activities. 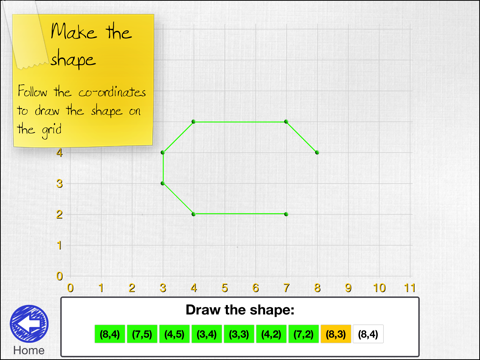 The numbers are presented as an ordered pair, x, then y axis, or across then up (or down) Use the tools to plot positions, draw shapes, check user understanding through verbal teacher-student interaction. Email or save a picture for use later. If you'd like a teacher tool for alpha-numeric (B6) I suggest you use the Map Maker or put a grid of masking tape on the floor. 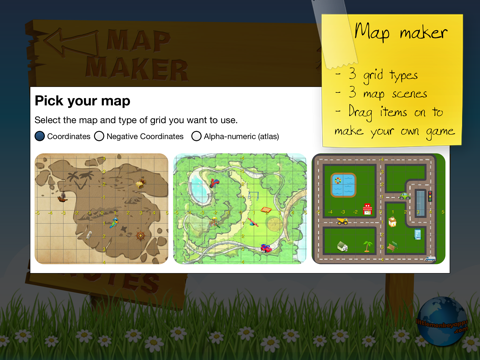 Create your own map! Choose from Co-ordinates, Negative Co-ordinates, Alpha-numeric (B6 like a road map), then from Pirate Map, Park Map or Town Map. Drag and drop the features onto the map. Once you have selected and placed at least five objects onto the map, press the next arrow to answer questions about your own map! Off the iPad, use a map from a local area, park or street directory. Come up with some basic questions, or have students write their own questions and answers. Have students DRAW a map of the local park or school, discuss how this might help visitors to find their way around. 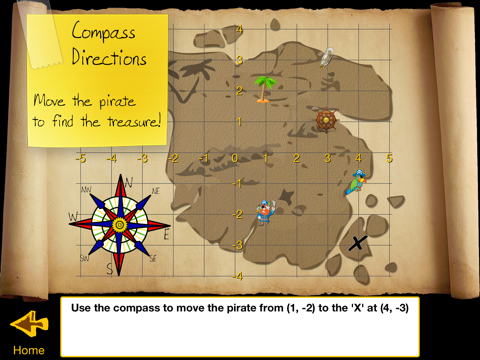 Press the compass rose to move the pirate to the X marks the spot to get to the treasure! Choose from co-ordinates or negative co-ordinates. As an off-iPad activity, set up a grid on the floor in masking tape. Tell students to move North, South etc. Have them move from one position to another in five moves, or seven moves or the shortest way. Put 'road blocks' in the way eg a plastic truck or tree. Select from Co-ordinates, Negative Co-ordinates, Alpha-numeric, then from Pirate Map, Park Map or Town Map. Answer the questions about the map you see! Reading skills are required to answer the multiple choice style answer. 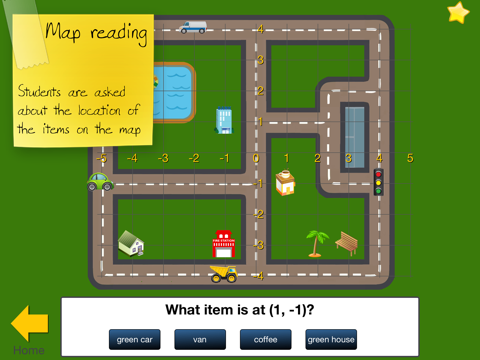 Off the iPad, use a map from a zoo, theme park or local attraction. Look at the symbols used on the map. Discuss why it is important to locate these symbols? Why do map makers use symbols and not words? Are there other features on the map? An introduction to plotting co-ordinates on a chart and graph. The numbers are presented as an ordered pair, x, then y axis, or across then up (or down). Select from Co-ordinates and Negative Co-ordinates. Users are asked to plot the positions on the chart to create a shape. Correct plots will turn green, current plot will be yellow. (You can't plot the next spot unless you get the previous one correct!) Encourages following directions. 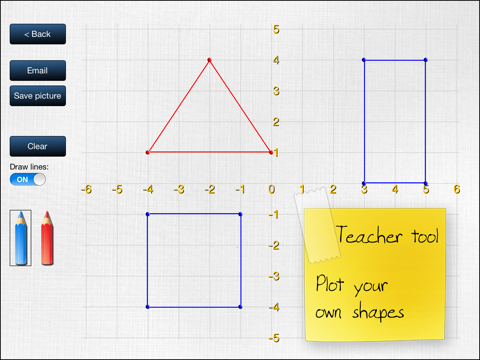 See Teacher Tool for some more off iPad activities. Compatibility: Requires iOS 7.1 or later. Compatible with iPad.